The application is a map onto which GeoJSON files (among other formats) can be dropped and viewed. 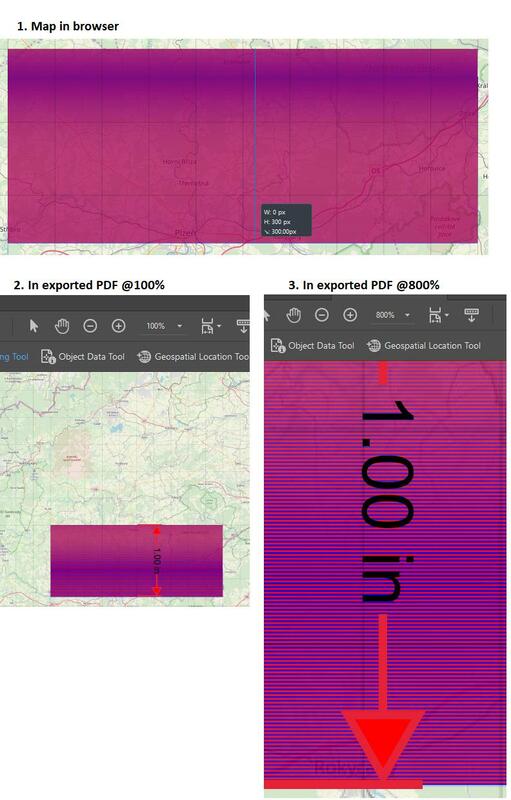 Recently we added a feature to print the current map view to PDF. The two parameters I need to test are size (A4, A3 etc) and DPI (which is fixed at 300DPI). c. displace one file by half the spacing so that the two sets of lines are interlocking, like a zipper. At this point I’m not sure what the result should be. I see a block, that’s for sure. But what colour will it be?! Colour of either GeoJSON or a mix? (Eg. red OR blue for the whole block, or purple)? And the key question... is this a valid test for proving 300DPI? I think I figured it out (still please correct me if I'm wrong). I was almost right with my original approach. My mistake was very basic and (dare I say it) stupid. I have been trying to squeeze 600 lines in one inch: 300 blue lines, 300 red lines. What I should have done is halve the amount of lines per colour: 150 blue lines, 150 red lines to give me 300 parallel lines in one inch. Now when I export the PDF, I get a purple(ish)-looking block when zoomed at 100%. If I zoom into the PDF, I am able to see the individual red and blue lines stacked on top of each other. I take it the purple colour when zoomed at 100% does not look uniform on my machine because of my crappy integrated graphics? Not the answer you're looking for? Browse other questions tagged maps or ask your own question.